PRESS RELEASE: ReBirth, the software application that started a sea change in the '90s with soft-synths in music creation, can be now carried in anyone's pocket. 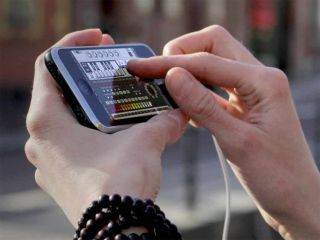 Propellerhead Software today announces the immediate availability of ReBirth for Apple's iPhone and iPod Touch. This is the first time a leading music tool developer has brought a complete professional desktop music application from the personal computer to the mobile world. ReBirth is a true reproduction of the Propellerhead's acclaimed music-making software from 1997 for the iPhone. ReBirth literally puts faithful emulations of dance music's vintage analog hardware at iPhone users' fingertips: the Roland TB-303 Bass synth and the Roland TR-808 and TR-909 drum machines. Combine these with audio effects units, fully featured pattern sequencers and a quick-acting, scalable iPhone interface and users will soon be making techno on the train, trance on the tram or beats on the bus. Roland's sub-heavy 1980 beat computer. Instant hip hop. Including tempo-synced digital delay, distortion, compression and special pattern controlled filter. Includes 5 original user modifications with alternative sound sets and graphics. ReBirth is available exclusively through Apple iTunes App Store, priced at EUR € 5.49 / USD $6.99. Rebirth is Propellerhead Software's first application for any mobile platform. It has been developed in conjunction with The Retronyms, a San Francisco software developer.